Honeycomb Table Tops 1HT provide the base on which precision optical and laser work is performed. The table tops have a honeycomb core inside. The table tops meet high requirements for rigidity, flatness, vibration isolation and damping. We work constantly to improve the design, weight and cost effectiveness of the table tops. Standard Honeycomb Tabletop 1HT consists of a 5 mm thick cold-rolled stainless ferromagnetic steel top skin, and 3-6 mm thick bottom skin, both bound under high pressure to a honeycomb core, using a special epoxy resin. Thickness of the skins depends on the dimensions of the table top. 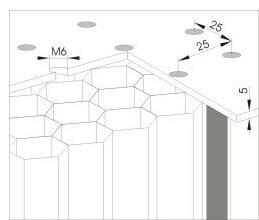 The top skin has a pattern (grid) of M6 holes spaced by 25 mm with ±0.1 mm accuracy. It allows to make very quick experimental setups, and, at the same time, ensures a high level of precision and reproducibility. The surface of the top skin is ground to flatness of ±0.1 mm over any 1 m2 area over the entire surface. The bottom skin is coated in a firm decorative coating. Our standard honeycomb core is made of 0.25 mm corrosion-resistant plated sheet steel. A special composition of epoxy resin guarantees adhesion, rigidity, stability and damping corresponding to highest requirements. The sidewalls of the table top are made of a special acoustically hollow plastic which damps acoustic vibrations. The sidewalls are covered in a decorative black leather substitute. Upon request a Laser Port can be embedded in the table top allowing a laser beam to be let through the table. The Honeycomb Table Tops 1HT have been mechanically and acoustically tested by qualified specialists. Real Closed Top - no way for liquids or tiny particles to get in. Only the holes you do use are open. Make "new" holes by yourself, by pushing in the plug with the help of a screwdriver, a hex key or another thin hard tool. If you need to re-seal the no longer used holes, let us know and we will provide polyethylene plugs that fit snugly into the M6 holes. 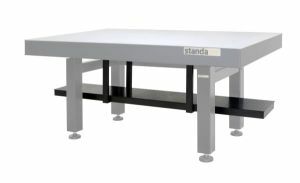 To clean the Standa "closed" tabletop, simply wipe the surface using a damp cloth (with cleaning agent if necessary). No need to clean each individual hole! Laser Ports are designed to lead a laser beam or cables through a Table Top. 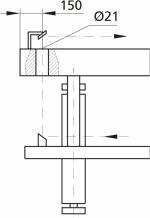 The standard location of a port is chosen for use with the Laser Shelves 1LS52. To specify a Laser Port in your order please append letter “H” to the code for a Honeycomb Table Top e.g. 1HT10-20-20H. Our company produces table tops according to customer's specifications. If imperial tapped holes pattern is required, choose the model from the table below and mention that requirement in your request.